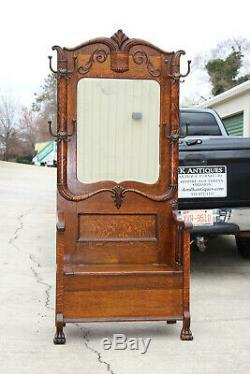 We are very pleased to have the opportunity to present, for your consideration, this Gorgeous Fancy Victorian Tiger Oak Hall Tree with Beveled Mirror and Paw Feet (Circa: 1890). This beautiful Victorian Tiger Oak Hall Tree weighs approximately 80 pounds and measures 82 ½ in total height, 37 ¼ in width, and. The height from the floor to the top of storage seat is 17 ¾. 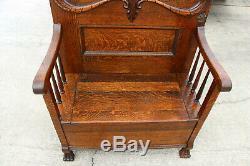 Many lovely details are found on this beautiful Victorian Tiger Oak Hall Tree. This lovely Victorian Tiger Oak Hall Tree has a beautiful fancy shell and incised carved oxbow-shaped top emanating from a dimensional vessel with shell-carved bottom. Elegant foliate appliques are found on each side of this dimensional vessel and provide the perfect accent for the lovely original beveled mirror. The beveled mirror glass alone measures 23 ¼ wide by 28 ¼ tall. 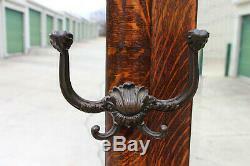 Next, you will notice that each side of the mirror is accented with four fancy shell-motif hat and coat hooks. 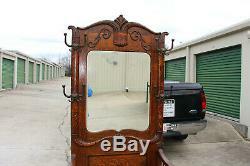 These fancy shell-motif hat and coat hooks rest on handsome dimensional tiger oak half-columns surrounding the mirror. Curved horn-shaped incised carved dimensional capitals on top of these handsome dimensional tiger oak half-columns form the shoulders of this gorgeous hall tree, while oxbow shaped ornamentation emanates from the bottom of the dimensional tiger oak half- columns to surround a center shell carving and to provide the perfect complement for the bottom of the mirror configuration. 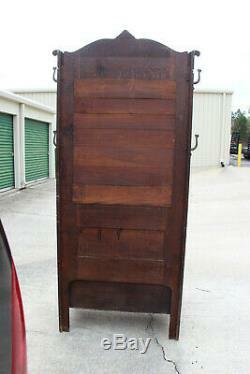 Beneath the mirror configuration you will see a recessed tiger oak panel with picture frame moulding right above the roomy lift-top storage seat. The roomy lift-top storage seat is accented with spindle arms on each side. Finally, elegant front paw feet complete this Gorgeous Fancy Victorian Tiger Oak Hall Tree with Beveled Mirror and Paw Feet. It is the perfect size to fit in most any home or office and is sure to add both beauty and utility wherever you would like to use it! Novice antique collectors should be aware that any antique over 100 years old will have some type(s) of slight or minor imperfections or marks of character. It is exactly these time-acquired features that intrigue collectors to ponder about how the piece must have been used and by whom. 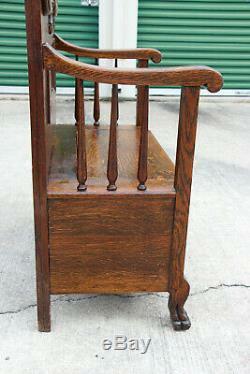 Such marks of use and character only add to the authenticity, charm, and desirability of the piece. Due to e-Bays new policy regarding contact information, we are only able to provide you with the names of the shippers and you will need to do an internet search to find their contact information. 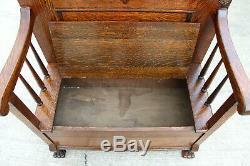 We hope that e-Bay will revise this very inconvenient policy change in the near future. Meanwhile, here are the shippers names. 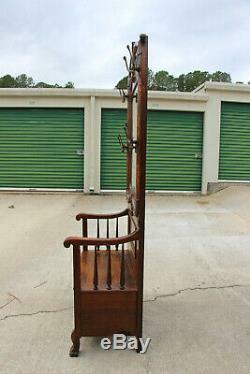 Please visit our e-Bay Store for additional fine items and feel free to stop by our facility to see any of our items in person if you are in our area. Our excellent customer feedback record is a testament to the fact that this philosophy works extremely well for everyone. 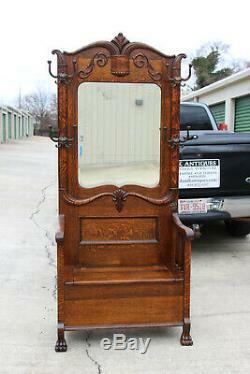 Gorgeous Fancy Victorian Tiger Oak Hall Tree with Beveled Mirror and Paw Feet (Circa: 1890)! 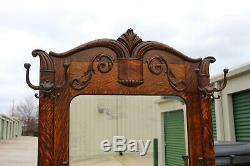 The item "Fancy Victorian Tiger Oak Hall Tree with Beveled Mirror and Paw Feet Ca. 1890" is in sale since Monday, March 11, 2019. 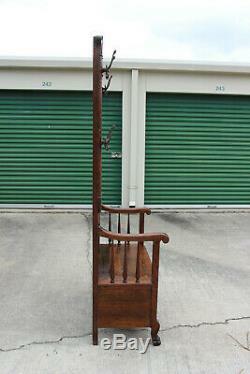 This item is in the category "Antiques\Furniture\Hall Trees & Stands\1800-1899". 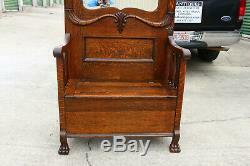 The seller is "dandkantiques" and is located in Raleigh, North Carolina.